The Eustoma Flower, also known as the Lisianths or Texas Bluebell flower originates from the Greek words eu (beautiful) and stoma (mouth), which refers to the flower as 'beautiful mouth' due to its coloring and shape. Eustoma Flowers are long stemmed and can usually grow from one to three feet tall, and the petals form a pretty trumpet shape. They are most often found in grasslands and bloom in summer with a rich color ranging from lavenders, pink, purples and dual color combinations. The Eustoma Flower is often used to symbolize a thoughtful, calming feeling, and are often used to accent garden areas or as indoor flower arrangements. This flower is also very low maintenance and is able to withstand higher temperatures and humidity indoors. It is an ideal gift for an anniversary or mothers day, and its rich colours and scent make it a popular alternative from traditional roses. Here at Clare Florist we have a selection of Eustoma Flowers available to order online, which we can arrange to be delivered out to you via our next day delivery service. 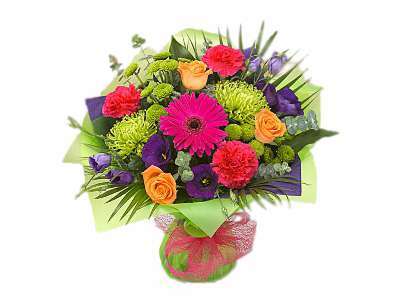 Our Vibrant Vibe Bouquet is a stunning arrangement of Cerise Gerberas, Orange Roses, Purple Eustomas, Green Bloom Chrysanthemums and Cerise Carnations to brighten up your room. This lovely bouquet is expertly arranged and packaged by our team of florists, and will be an excellent table centre piece.